It's that time of year! If you are looking to buy a Chromebook for a loved one as a Christmas gift, you've come to the right place. Chromebooks make for great gifts, as they are inexpensive and easy-to-use. One thing to keep in mind this year is that all Android apps will soon be available on Chromebooks, so touchscreen Chromebooks are in vogue. While we wouldn't normally recommend any non-touch Chromebook with only 2GB of memory, we're going to break our own rule for the first recommendation. The reason is that the Samsung Chromebook 3 provides a budget-friendly option for basic web browsing and productivity tasks on an 11.6-inch display. While the Samsung Chromebook 3 won't offer touch functionality for Android apps or a lot of RAM for intense multi-tasking, it will get the job done for many tasks, such as watching YouTube videos, streaming music, reading the news, and browsing social media. 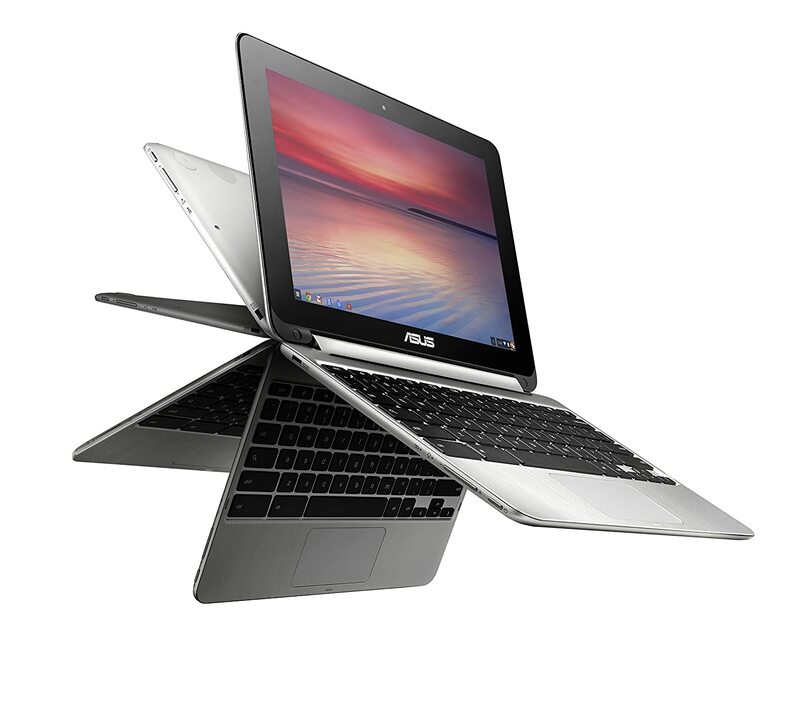 The ASUS Chromebook Flip makes it onto our round-up list for the second year in a row! Like all 2-in-1 convertible Chromebooks, the screen on this device flips all the way around backwards so that it can be used like a tablet. When the screen is folded back, the keys on the keyboard become disabled so that only touch inputs are detected and an on-screen touch keyboard will appear as needed. This Chromebook is very lightweight, yet features a sturdy aluminum construction. It does have a smaller keyboard and smaller display, which may not be suited to users with larger hands or those who require larger displays. This Chromebook may be more ideal for users who are on-the-go. The Acer R11 is a nice step up in quality and size from the ASUS Flip C100. This is a 2-in-1 convertible Chromebook that is a more adult-friendly size. The keyboard is comfortable to use and more similar to most laptops than the ASUS Flip C100. The R11 features a hybrid build of molded plastic and aluminum, allowing for durability while maintaining a lightweight form, increasing its portability for users who are on-the-go. With Androids apps on the horizon, this will be a great, cost-friendly laptop for using your favorite touch-enabled apps! The Acer R13 is the big brother to the Acer R11, and this is the current reigning champion of touchscreen Chromebooks! This is another 2-in-1 convertible Chromebook that will work wonderfully with Android apps. This is a faster, more powerful version of the R11 that features a larger, better display as well as longer battery life and a fully aluminum build. If you can afford the larger price tag, this is the Chromebook to get this holiday season! Final thoughts - Just a penny! Note: With Android apps forthcoming, we highly recommend buying all touch-enabled Chromebooks with 4GB rather than 2GB of memory (RAM). All links provided will direct you to the most suitable model. *Advertised battery life changes with the type of use. Streaming video will use more battery life than working on a Google Doc. Lower display brightness will help conserve battery life as well.